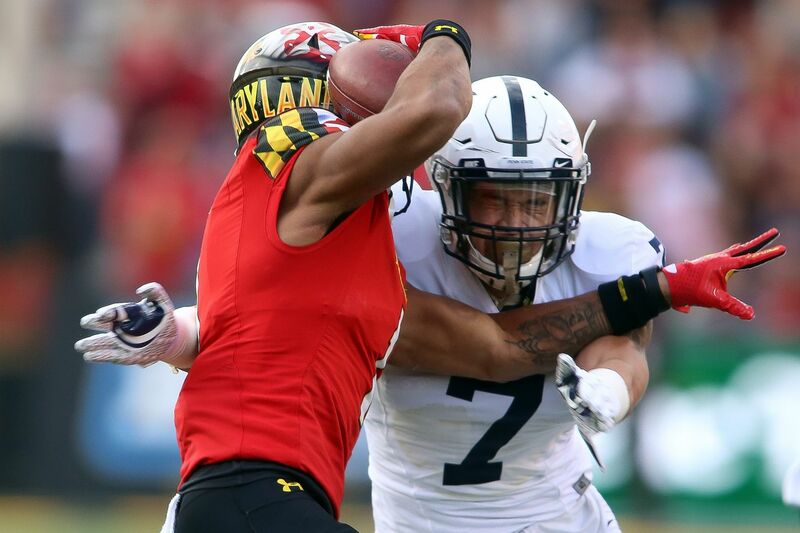 Penn State linebacker Koa Farmer (7) zeroing in on Maryland wide receiver D.J. Moore during a game last season. 6-1, 236, Gr., Lake View Terrace, Calif.
Farmer, who initially came to Penn State as a safety, continued his improvement at strong-side linebacker last season and finished sixth on the team with 48 tackles while starting all 13 games. The only Californian on the Nittany Lions roster returned kickoffs as a redshirt freshman and began the following season at safety before being moved to linebacker early in the season. He is expected to be a leader on a deep unit that's short on experience. Cooper (Archbishop Wood) has experienced his share of bad luck during his Nittany Lions career, being limited to 13 games in his last two seasons because of injuries. Still, he is in the mix at two spots — the middle and weakside — among the linebacker corps and hopes to make his bid to be part of the top two at the position without being struck again by the injury bug. Cooper tested No. 2 in the strength index among the team's linebackers. Parsons, one of the top high school prospects in the country last year, is receiving the most attention of any Penn State freshman in years. Not only is he playing at "100 miles an hour," as defensive coordinator Brent Pry likes to say, he has impressed coaches with the amount of film study he puts in and the questions he asks. A defensive end in high school, he started the spring at middle linebacker before moving to the weak-side spot, and is getting his share of reps in the middle in training camp while learning how to play more disciplined at the position. Micah Parsons, here carrying the ball for Central Dauphin, has impressed Penn State coaches with his work ethic. 6-2, 231, R-Jr., Mohnton, Pa.
Johnson, a member of the Nittany Lions wrestling team during his true freshman season, has steadily moved his way into contention for a starting spot at middle linebacker this season. He played in six games last season after coming back from a season-ending knee injury suffered in 2016. Franklin has praised Johnson for his ability to pick up the defense quickly, and that certainly helps his chances to be in the starting lineup on Sept. 1. 6-5, 226, Jr., Burtonsville, Md. After making the Big Ten all-freshman team, Brown did not seem to take a significant step forward in his play last season although he did excel on special teams. He was given a shot at middle linebacker in the spring but could find himself playing more on the weak side in training camp. He has shown an ability to be effective on the blitz and could have a role there. 6-1, 238, Sr., Barnegat, N.J.
Bowen is the mystery man among the Penn State linebackers, having been suspended for the final four games of last season amid indications he would not be welcomed back. But Franklin allowed him to return to "give him the best opportunity to graduate in December." Franklin called his role "undefined" at the start of training camp. But with 21 career starts, mostly on the weak side, Bowen, who was fifth on the team in tackles last season despite playing just nine games, could have a chance to see playing time. Penn State’s Manny Bowen (43) celebrating a sack against Michigan last season. 6-1, 237, R-Fr., Mechanicsville, Va.
Brooks impressed the coaches last season with his play on the scout team while he red-shirted, and is considered to be in the mix for a spot in the linebacker rotation. 6-3, 236, Fr., Ottawa, Ont. Luketa received rave reviews for his play in the spring, and that has continued in training camp. Franklin likes his maturity, a trait developed after Luketa left home to attend boarding school for three years at Mercyhurst Prep in Erie, Pa.